“He did not suffer fools gladly and hated ‘triumphalist’ and ‘nationalistic’ propagation of literature and other arts that lacked sincerity and theoretical vigour. He had an immense understanding of literature as a craft and an expression of a people’s experience.” – Sandile Ngidi, Lewis Nkosi’s local agent for his last book, Mandela’s Ego. The ninth edition of Wordsetc is out. It leads with a heartfelt profile of Lewis Nkosi ,who died late last year. Nkosi was the last of the much-celebrated crew of Drum journalists of the 1950s. After Drum, he went on to conquer the world of academia, lecturing posts at various universities during his exile from South Africa. He is regarded as a perceptive, if sometimes pugnacious, essayist and literary critic who had no qualms speaking his mind. His most famous book is Mating Birds, an explosive novel about miscegenation that won both praise and criticism. In this warts-and-all profile Nkosi comes alive as a man with a bohemian streak and a man of letters who relished a good intellectual fight. Early in 2008 he exclusively wrote a weighty essay for Wordsetc on how he writes. We are proud and humbled to feature it for the first time in this current edition. The edition’s other contents are equally absorbing. Mike Sager, our California-based editor at large and novelist, goes to a banquet in honour of Gay Talese, a pioneer of New Journalism. Amanda Patterson reflects on her writing career and how she started her successful writing course. Meanwhile, Kimon Neophyte assesses Tolstoy’s legacy a hundred years after his death, while Pumla Dineo Gqola delves into slave memory and how it affects South Africa today. Matthew Freemantle relives the horror of a bus ride from Dar es Salaam to Johannesburg with two border jumpers. Cynthia Jele tells us how she writes her novels while Prof Kole Omotoso looks at Nigerian literature fifty years after independence. Botswana novelist Lauri Kubuitsile relates the experience of taking up an exceptional writers’ residency in Egypt. There’s also a delightful short story by Carly Brown. In our appraisal section Joe Thloloe pays tribute to Alf Kumalo, a world-renowned photographer he describes as “a poet with a camera”. The seventh edition of Wordsetc, South Africa’s foremost literary journal, has just reached the shelves! The publication continues to showcase the best of South African literature. This time around it focuses on crime fiction as a theme. Guest edited by author and editor Joanne Hichens the edition explores the ins and out of the genre, the motivation of crime writers to write crime fiction, and takes a look too at real-life crime in our society. Read all about Margie Orford’s success – how she makes crime pay – with her Clare Hart series, in the main profile by Sam Beckbessinger. There are also illuminating essays by writers such as Hichens, Jassy Mackenzie, Sarah Lotz, Richard Kunzmann, Roger Smith, Helen Moffett, Andrew Brown, Justice Malala, Emma Chen, Thembelani Ngenelwa and Megan Voysey-Braig. It’s a feast of reading for the literati or those who simply can’t get enough of South African literature. Subscription is R170 for four editons. This sixth edition of Wordsetc, South Africa’s foremost literary journal, is out. Hot on the heels of a fantastic edition that looked at the iconic Nadine Gordimer, the latest edition continues to showcase the best of South African literature. It leads with novelist Imraan Coovadia, a young writer on a mission. He also teaches creative writing at the English Department at the University of Cape Town. He has just written his third book, High Low In-between. We explore what makes him tick as a writer, the themes he explores, his literary influences and even the music he listens to. The rest of the contents are also sizzling. 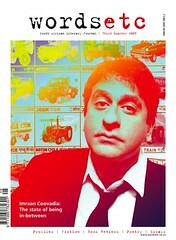 The main profile is on novelist Imraan Coovadia, author of the recently published High Low In-between. We explore his work, the ambiguities that he tackles about Indians in the country. In the Personal Notes section, activist Zachie Achmat relives the days of his imprisonment at the age of 15 for political activism (“My Father’s Touch”). He has bittersweet memories of his father. A touching read. Over the years advertising icon Alistair King of King James Advertising has amassed a special collection of rare books. In an eloquent and humorous essay he tells why he frequents second-hand bookstores in search of that rare book (“The Collector”). Award-winning journalist Kevin Bloom tells us about motivation behind writing Ways of Staying, a book that takes an unflinching view at the state of the South Africa. Some may describe the book as bleak, but deep down, Kevin makes a case of being a realist (“The Realist”). Literary critic and writer Karina Magdalena Szczurek profiles seven of our top writers in South Africa. She specifically looks at how these writers hang on to their full-time jobs and still manage to write creatively (“Writers’ other lives”). A very illuminating feature. In the Appraisal section, researcher and academic Joy Watson offers a rich narrative about the legacy of Ruth First as a writer and champion of social change (“Her words”). For the past two years Victor Dlamini has been taking gorgeous photography of some of our remarkable artists, including writers. Across a spread of six pages, he shows readers his awesome work (“Capturing creative spirits”). In the How I Write section, acclaimed novelist Angelina Sithebe details how the writing business happens for her. Lindiwe Nkutha’s wonderful play called Woman In Transit is captivating in telling of a young woman from the countryside who comes to Johannesburg in the 1950s to find a city full of degradation, and her ultimate defiant stand against injustice. We publish an extract of the play. In our new Poetry section, Seni Seneviratne, an acclaimed poet and performance artist from Britain, tells us about the central role poetry plays in her life. In our Bookshelf Series, Absa’s marketing head Happy Ntshingila talks about the writing of his new book Black Jerusalem in which he reminisces about the heady days of crafting winning advertising pitches in his earlier life as a founding partner at Herdbouys advertising, the first black-owned advertising agency in the country. There’s all this and more – literary travel, short story, book reviews, a restaurant review and listings pages. As with previous five editions, this issue is jam-packed. It will satisfy literature lovers and those keen to know more about the state of South African literature at the moment. For an interview with publishing editor Phakama Mbonambi, or to excerpt any of the stories from Wordsetc, please contact him on 083 287 1955 or Flamencomail@gmail.com. See website at www.wordsetc.co.za or Facebook group called Wordsetc – A South African Literary Journal. Wordsetc is available at bookshops (Exclusive Books, CNA and many independent bookstores such as Boekehuis, Kalk Bay Books, Clarke’s Bookstore, Protea Books and The Book Lounge) and various alternative distribution points such as DVD Gurus, Absolutely Fabulous DVD Nouveau (Morningside), Service Station Café and Wild Olive Food Store (Greenside) and Michael Stevenson Gallery (Cape Town). The journal retails for R49.95. Subscription is R170 for four editions. Back copies are available. Just write to Flamencomail@gmail.com. To commemorate Barack Obama’s inauguration today, Wordsetc brings you this piece from our latest edition by Barbara Nussbaum. I wrote this psalm the day on November 6, a day after Barack Obama was elected US President. The previous day, Obama had delivered an unforgettable acceptance speech. I had been stunned and moved by a sacred moment in time. It was a day where history felt blessed. Like billions of people around the world, I shared a contagious hope for a different future. And then, part of me felt a deep and sober sadness. What has taken us so long as a world to wake up? I was born to Jewish parents in Bulawayo, Zimbabwe. My father and grandparents had fled the Holocaust in Germany. We had lost many relatives to the Holocaust, so witnessing any ignorance in the world about race, religion, ethnicity and colour has continued to be a concern. Watching the tears rolling down Jesse Jackson’s face and Oprah’s face, I cried too. Mine were tears of catharsis. I was crying for a world, which had taken too long, to care. Paradoxically, in a moment that defined the possibility for collective transformation, I finally felt free to acknowledge a profound sadness and disappointment. How long we have taken as a world to make a collective choice for change. Finally in Obama, we have a leader with a magnificent ability to communicate across class, across race, across nations. He touches so many of us who yearn for the power of our connection as human beings. By the next day, I had slept peacefully and began to write the psalm, starting to feel the joy and the abundant blessings of Obama’s election. In the writing, I felt the gratitude for all the dreamers and visionaries I have met in my life. I realised that many of us hope and dream and I wanted to acknowledge all who dream and all who are bold enough to dare to hope audaciously. That day, I saw the possibility of hope in the millions of faces on the television screen. For in Obama, the world has a leader whose awareness of our interconnectedness combines with a powerful stand for hope and for change. Obama’s ability to articulate the ways in which we are intertwined as human beings speaks to a zeitgeist, a moment in time, when the world is hungry for his message. Our choices and decisions, small and large, individually and collectively, affect each other continuously and have repercussions globally as we discover how interlinked we are in our communities, in our businesses, in our countries and in our world. Obama speaks to this so brilliantly and inspires us. This moment felt sacred for the world and sacred in my own life’s journey. When I hear Obama speak, I recognise an ubuntu exemplar. These are people I watch for, people who give my own life meaning and inspiration. To give some context and background, I have had the privilege of living between the US and South Africa during the past sixteen years. Frightened after being mugged in Joburg in 2000, I bolted to the US, just in time to witness the horror of George W Bush stealing that election. Seeing images of collective disappointment on the television hurt me. I witnessed the gaping chasm in a nation divided, puzzled and angry. I was shocked and in the noise of my own outrage, noticed the beginning of a profound inner dialogue. It went something like this. How could American politics be different if ubuntu was part of the equation? How could the world be, if ubuntu was widely practised? What would American capitalism look like if sprinkled with African ubuntu? All these questions were alive for me. In the sweet intensity of those moment, life felt large and the questions irresistible! These have stayed with me, like a slow insistent drum beat that needed to be heard. My own pathway to ubuntu emerged in unexpected ways. Through research for a thesis, on African dance, I began to understand something about the power of the social processes and the genius of the emotional intelligence that lives in African culture. The research proved to be an unusual passport into an unexpected forum in 1995 – Wits Business School’s South African Management Project. The intention of the project was to acknowledge how Eurocentric our corporate culture was in South Africa and to explore how and why African culture might be better understood and more effectively accommodated in the business setting. We started to document how and why African culture was relevant to the work place. I met some stellar personalities who became my mentors and teachers. Through their eyes, I began discover the valuable heritage of African culture. Through their wisdom, I learned about the gold that lies deep within the soul of this country. And ubuntu stayed with me, even thousands of miles away in America. So returning to that unfortunate November 2000, when I watched a different President-elect assume “glory” on a television screen, the questions evoked in the aftermath of that election stayed with me. I finally settled on taking up the challenge of writing about ubuntu for Americans. This seemed a crazy idea, but I felt deeply moved and started writing. The events of September 11 2001 fuelled my motivation to write even more. By the end of 2002 I had completed an eight thousand-word article on ubuntu. It was published by the World Business Academy (www.worldbusiness.org), a cutting edge think tank, based in California, where I was then living. I cried for several days after the acceptance of the article. Not only because of the awe of personal achievement but because of the feedback of Rinaldo Brutoco, founder and president of the Academy about the importance of ubuntu for the world. Brutoco, a visionary and a futurist is surrounded by fellows who are thought leaders. For Brutoco, ubuntu captured where we need to go as a planet. Then (and now) he believes that the only conscious choice we have as a planet is to acknowledge our interconnectedness, and to know that we are only people through other people, collectively responsible for creating a world economy that works for all. The insight I gained from Brutoco is that Africa’s gift to the world is ubuntu. Sadly we don’t value ubuntu much or recognise the many ways that this concept has influenced our history. In our obsession with the politics of the day, we forget how magnificent our own transformation process has been. We don’t recognise that we are leaders in the art of dialogue that so often holds the possibility for collective transformation. This is a gift we can share if we choose to see it for ourselves. I continue dreaming and writing about ubuntu in the midst of cynicism about the word, especially in South Africa where it is overused, misunderstood and misinterpreted. Since 2006 I have been watching out for ubuntu exemplars and collecting their stories. And since the beginning of this year, I have been excitedly following Obama, noticing his language of we – of connection. His speeches reveal a remarkable gift of articulating the bonds that connect us as human beings. He sews the golden thread of our shared humanity in his careful choice of words and images. At the end of his influential speech on race earlier this year, Obama described the mutual recognition between Ashley, a young white girl who had been eating mustard and relish sandwiches for a year, and an old black man. Asked why he was at the meeting, the black man said he was at the meeting because of Ashley. In that speech, and that story, I recognised that in Obama we have an ubuntu exemplar writ large. Really large! Obama inspires those of us who dream to dream more, to dream with hope. He, like our beloved Madiba, inspires us to be bold and to believe in a more humane world; a world in which we value each other, care about each other, respect each other and love each other. I wrote the psalm as a global citizen with the heart of a daughter of Africa. Inspired by the oceans of change I see, I choose hope. Yes hope, even during a time when too few political leaders glow with the alchemy and magic of Madiba or Obama, in our country and in our world. My greatest hope is that we not only value what Obama is bringing to America and the world, but that while acknowledging his greatness, we recognise our own greatness as South Africans and the gift of ubuntu we can bring to the world. By turning to books to tell his complicated life story, Barack Obama successfully sold his grand vision for his country that would otherwise have viewed him as too exotic, and perhaps, unelectable, because of his race and Islamic name. This fourth edition of Wordsetc, South Africa’s foremost literary journal, looks at the life of the US President-elect through the prism of literature. Inside Obama the politician there’s Obama the writer. The edition also looks at what he stands for and the unprecedented results of the 2008 US presidential election. In addition to the main profile, there are plenty of in-depth essays offering different perspectives on what Obama represents. In the main profile Wordsetc editor and publisher Phakama Mbonambi notes that Obama used a stirring memoir (Dreams From My Father) to sell his life story and convince a sceptical electorate that his name and heritage may be exotic to a US audience but he was, in fact, electable to the ultimate public office – the Oval Office. His roots as a writer are also explored, with his mother looming large. At a Democratic Convention in Boston during the 2004 presidential race, a little known senator from Illinois called Barack Obama gave a keynote address that sought to unify the US. He said there were no red states for Republicans and no blue states for Democrats; that there was no America for whites, blacks and Latinos but one United States of America for all. Many at the convention shrieked with delight and many more were moved to tears. His powerful speech catapulted Obama to political stardom and helped him launch his current history-making run for the White House with a promise of change. With Obama-mania in full swing across the world, it is timely to get a book that looks at his rise to political superstardom. Journalist David Mendell followed Obama for three years, covering his political ascent. So he knows his subject intimately, enabling him to paint a well-rounded portrait of Obama, a man who has become synonymous with clean politics and hope. South Africa may not widely read them or even give them the respect they deserve but these five women know how to tell a damn good story. South African literature possesses a rich tradition of black women’s imaginative, creative writing. In various anthologies like Daughters of Africa (Jonathan Cape, 1992) and Women Writing Africa: The Southern Region (Wits University Press, 2003), one may see traces of such creative writing about, and engagement with the world, but what is often missing from the popular memory is the substantial bodies of work these pioneers have bequeathed us. Several of their novels and anthologies are out of print, and are likely only to be found in remaindered piles at bargain bookshops rather than on school curricula or in school libraries, never mind in the hands of young readers on trains, taxis and buses. This is indeed cause for national shame; these women writers deserve to be read and to be treasured, to be celebrated in the ordinary acts of people opening their books and taking in the stories they have to tell. Far from being polemicists, writers like Bessie Head and Miriam Tlali demonstrate their talent by giving us stories that are funny, poignant, tragic, dramatic, and historical; tales interested in questions of love and desire as much as they are reflections on issues of loss, mourning and survival. In other words, they give us a literature fully engaged with the whole gamut of emotional states which make us human, not just the sort of political fictions usually associated with the literature of apartheid South Africa. Apt for Women’s Month, the third edition is a dedicated to women writers. It’s called “Women & Words”. It looks at the gender issues through the prism of literature. It has some exciting and stimulating content. The lead story is about Olive Schreiner, written by Heather Parker Lewis, who describes herself as a Schreiner groupie. Other contributors are Jo-Anne Richards (My Brother’s Book), who writes about how she composes her characters as well as Anne Landsman (The Rowing Lesson). There’s also an exciting story about the plight of Mumbai bar dance girls, while local women publishers tell us what makes them choose manuscripts – gender or quality. First published 10 June 08. The second edition of Wordsetc is out and the site has been updated. Yes, both events took a while. They also took all our energy. Apologies for those who got impatient. We are new in this. We’re learning the terrain – fast. We endevour to keep getting better and doing things a littler quicker. We thank those who have supported us. They have done so because they share our vision of promoting African literature and great writing from elsewhere in the world. Wordsetc’s premise is that literature plays a crucial role in society. Literature can make us aspire to be what we are not. It also helps highlight the commonality of human condition. As I write this, thousands of fellow Africans are in makeshift encampments in Johannesburg, having fled their homes due to senseless xenophobic attacks that have seen Africans hacking other Africans to death on baseless grounds. How can this happen now? Have we only recently, as a country, resolved that such ethnic violence will never again plague us? Our only hope is that literature — and all of the arts — can help us to transcend our lowly human conditions, our base predijuces and emotions. Perhaps by reading each other’s stories, by listening to each other’s music, by seeing each other’s stories told through painting and photographs, we can learn to appreciate our commonality as human beings, we can learn to stop dwelling on differences. Perhaps, through the arts, we can cleanse our poisoned souls. Elsewhere on this site, the South African writer Zukiswa Wanner clearly articulates her anger over the senseless attacks. Justifiable anger, to be sure.